Open from 10 to 1 pm and 2 to 5 pm, seven days. 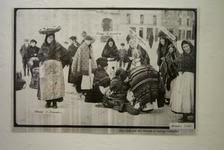 The Galway Museum is essentially a folk museum and it features a considerable number of artifacts related to the fishing industry, which was, and is an integral part of tradition in the city. 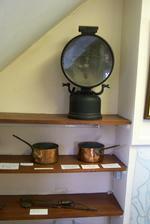 The museum aims to provide a cross section of the antiques and implements that were historically used in Galway, reflecting its traditions. Artifacts include farm implements and tools as well as pieces of machinery. There is an impressive collection of military material, including arms. Galway's medieval heritage is also represented in the medieval section, along with a series of 17th century stone carvings. 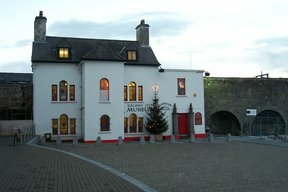 Galway City Museum was established in 1976. The premises were built c.1800 as a private house. In recent years they have been occupied by the Comerford and Greenwood families and between 1948 and 1954 by the sculptress Clare Sheridan. 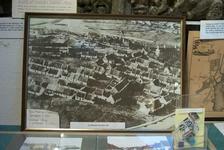 It became part of the Corporation's administrative offices for a period, prior to the establishment of the Museum. 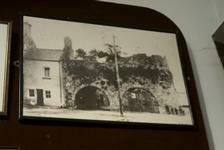 Beside the entrance door, on your right as you approach, you will see the Blind Arch and the Spanish Arch. Originally there were four arches. The Museum now occupies the position of the two inner arches. The original Docks were build in 1270 and are now under the foundations of the maroon painted building, on your left as you enter. In 1584 the new Docks were completed. The use of the arches is obscure, it is possible they were used as a storage facility outside the Walls, in this way no taxes would have been levied on the goods stored there. A re-erected fireplace, dated 1602, can be seen in the Blind Arch. It bears the arms of the Lynch and Penrice families and the initials M.L. Entering the Museum, on your left, are some reminders of the prowess of the Connaught Rangers, a Regiment of Irish Soldiers in the British Army. Teminders here also of our Insurrection of 1916 and the Civil War. 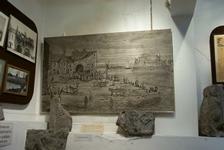 The great map of 1651 is displayed adjacent to the carriage of Lady Bandon of Fermoy, Co. Cork. The carriage was built in London in 1850. 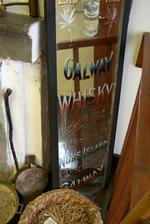 On the other side of the spiral staircase and overhead are some fine examples of mirrors from Galway premises. Beneath are examples of medieval stonework, some early 17th century, depicting coats-of-arms of some of the ancient city families, the Arms of Galway of 1647 and other stonework. 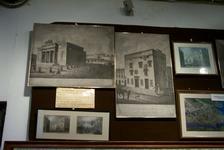 Various early photographs of Galway, Claddagh and the Claddagh Residents are one display together with some old maps and sketches, a Bellarmine Jug and examples of old Rush Lights and early candles. A recent acquisition is a replica in bronze of the Galway Bronze Age Horn, a musical instrument in use from c.1200 - 700 BC.